Just another day in the Marvel universe. With Vision back online and Hank Pym finding a way to help Starfire use her powers without killing herself things seem to be going well for the Avengers, although Vision is silently dealing with Wanda’s renewed relationship with the restored Wonder Man. Meanwhile Hawkeye and the Thunderbolts travel to the old Dominus base, hoping to use the leftovers for their new headquarters. Concerned about why Hawkeye is with the former villains they head of in pursuit and engage in battle. Hawkeye wants to see how his team will handle themselves, which leaves tensions high when the base’s remains changes into the giant robot Dominex. Dominex plans to self-destruct at a weak point on Earth, leading to the planet’s destruction. 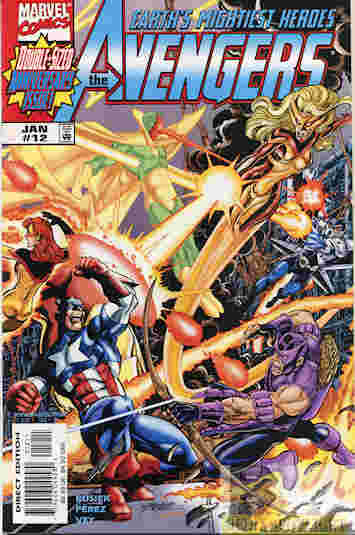 The T-Bolts manage to get inside and after some debating among the Avengers are given aid by Hank and a recovering Tony Stark to destroy the robot and save the world. The Avengers decide to let them go and hope they’re on the level. What they got right: Well at least the hero versus hero nonsense Marvel overdoes made sense in the story. The fights are all pretty good and Dominex made for a good one-time threat. And although I got on Busiek’s case recently about reusing the “slowly being killed by their own powers” thing with both Iron Man and Firestar he does offer a solution for her problem, and admittedly Tony’s is coming in his own comic. What they got wrong: “Wrong” is a harsh term since it’s a personal problem, not a problem with the story. I just didn’t find myself caring about the Vision/Scarlet Witch/Wonder Man love triangle, but I don’t follow the series and I’ve just dealt with too much soap opera in my superhero stories lately. (See the reason I dropped Steel.) So it didn’t work for me but it was probably important to their then-current character arcs. Recommendation: A good crossover and we’ll see how this affects the Thunderbolts in their own comic. Worth checking out. Posted by ShadowWing Tronix on July 31, 2018 in Marvel Spotlight, Yesterday's Comics and tagged Avengers, Marvel Comics, Marvel Universe, Thunderbolts.